Medal of Honor nominee Felix M. Conde-Falcon was born in Juncos, Puerto Rico, Feb. 24, 1938, and raised in Chicago, Ill. He volunteered to join the U.S. Army in April 1963. Conde-Falcon distinguished himself on April 4, 1969, while serving as a platoon leader during a sweep operation in the vicinity of Ap Tan Hoa, Vietnam, April 4, 1969. Conde-Falcon was killed in action that day after destroying multiple enemy bunkers and demonstrating extraordinary leadership under fire. He left behind a wife and two children. In addition to the Medal of Honor, Conde-Falcon received the Distinguished Service Cross (this award will be upgraded to the Medal of Honor on Mar. 18), Bronze Star Medal with “V” Device and one Bronze Oak Leaf Cluster, Army Commendation Medal, Army Good Conduct Medal, National Defense Service Medal, Vietnam Service Medal with three Bronze Service Stars, Combat Infantryman Badge, Sharpshooter Marksmanship Badge with Auto Rifle Bar, Expert Marksmanship Badge with Rifle Bar, Marksman Badge with Pistol Bar, Drill Sergeant Identification Badge, Republic of Vietnam Gallantry Cross Unit Citation with Palm Device, Republic of Vietnam Campaign Medal with “60” Device, Republic of Vietnam Merit Medal, Republic of Vietnam Gallantry Cross Unit Citation with Palm Device, Republic of Vietnam Civil Actions Honor Medal Unit Citation, First Class with Oak Leaf Cluster. The President of the United States of America, authorized by Act of Congress, July 9, 1918 (amended by act of July 25, 1963), takes pride in presenting the Distinguished Service Cross (Posthumously) to Staff Sgt. 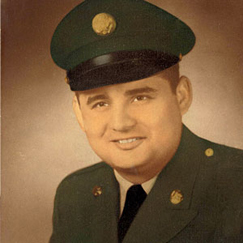 Felix M. Conde-Falcon, United States Army, for extraordinary heroism in connection with military operations involving conflict with an armed hostile force in the Republic of Vietnam, while serving with Company D, 1st Battalion, 505th Infantry, 3rd Brigade, 82nd Airborne Division. Conde-Falcon distinguished himself by exceptionally valorous actions, April 4, 1969, while serving as platoon leader during a sweep operation in the vicinity of Ap Tan Hoa, Vietnam. Entering a heavily wooded section on the route of advance, the company encountered an extensive enemy bunker complex, later identified as a battalion command post. Following tactical artillery and air strikes on the heavily secured communist position, the platoon of Conde-Falcon was selected to assault and clear the bunker fortifications. Moving out ahead of his platoon, he charged the first bunker, heaving grenades as he went. As the hostile fire increased, he crawled to the blind side of an entrenchment position, jumped to the roof, and tossed a lethal grenade into the bunker aperture. Without hesitating, he proceeded to two additional bunkers, both of which he destroyed in the same manner as the first. Rejoined with his platoon, he advanced about one hundred meters through the trees, only to come under intense hostile fire. Selecting three men to accompany him, he maneuvered toward the enemy’s flank position. Carrying a machine-gun, he single-handedly assaulted the nearest fortification, killing the enemy inside before running out of ammunition. After returning to the three men with his empty weapon and taking up an M-16 rifle, he concentrated on the next bunker. Within ten meters of his goal, he was shot by an unseen assailant and soon died of his wounds. His great courage, his ability to act appropriately and decisively in accomplishing his mission, his dedication to the welfare of his men mark him as an outstanding leader Conde-Falcon’s extraordinary heroism and devotion to duty, at the cost of his life, were in keeping with the highest traditions of the military service and reflect great credit upon himself, his unit, and the United States Army. Conde-Falcon is set to receive the Medal of Honor posthumously in a ceremony at the White House on March 18.